In order to fight fake news, WhatsApp has announced a new feature called Forwarded label. The new “Forwarded” label will indicate that the message has been reshared and not originally written by the sender. The Facebook-owned company believes that the feature will help it stop spreading fake news. This feature was under testing for Android beta users last month. Now, it will be available with the latest version of WhatsApp for all Android and iOS users across the globe. With the feature, messages that are reshared in a group or personal chat will come with ‘Forwarded’ tag. Last week, WhatsApp also started testing the ‘suspicious link detection‘ feature to help users to detect fake news links. According to WhatsApp, its latest feature which is the “forwarded” label for reshared messages is likely to be an important tool to fight misinformation and fake news. People will know if some message is actually written by the sender or it is just being forwarded. WhatsApp has come under scrutiny in India after several incidents of fake news being spread through its platform that cause the disorder. The government asked it to do something about the spreading of fake news. So, WhatsApp has been working on features that can be helpful in identifying as well as stopping the misinformation. “Starting today, WhatsApp will indicate which messages you receive have been forwarded to you. This extra context will help make one-on-one and group chats easier to follow. 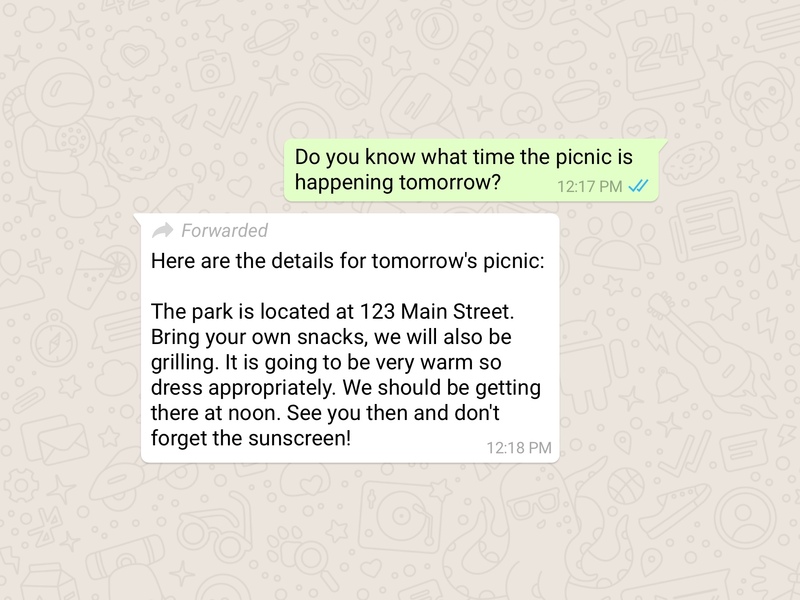 It also helps you determine if your friend or relative wrote the message they sent or if it originally came from someone else,” WhatsApp wrote on the company blog.